Spacious Bedroom with flat screen t.v. Private Balcony with beautiful mountain view. 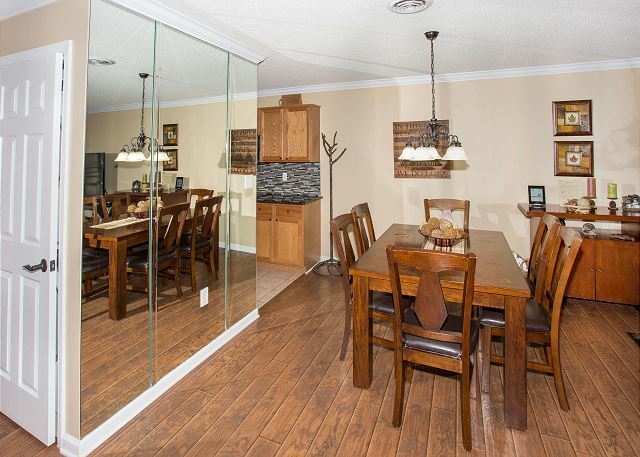 Unit 552 Whispering Pines is a 2 bedroom, 2 bath condominium with all the features of home and more. Both bedrooms have king beds, a ceiling fan, and TV/VCR (Netflix is available in this unit), and the master had an in-room Whirlpool tub. 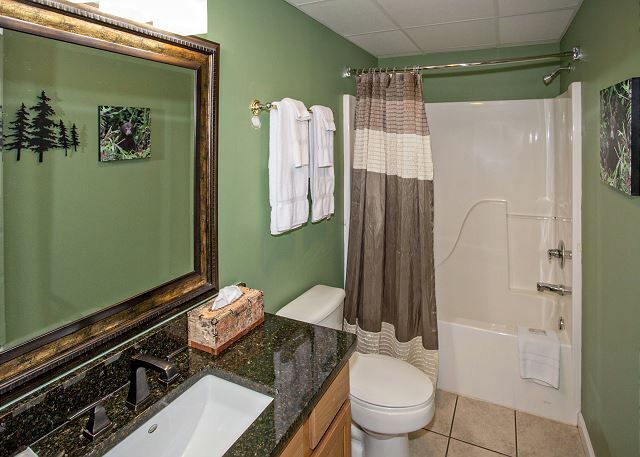 Each bathroom offers a tub and shower combo with tiled floor. 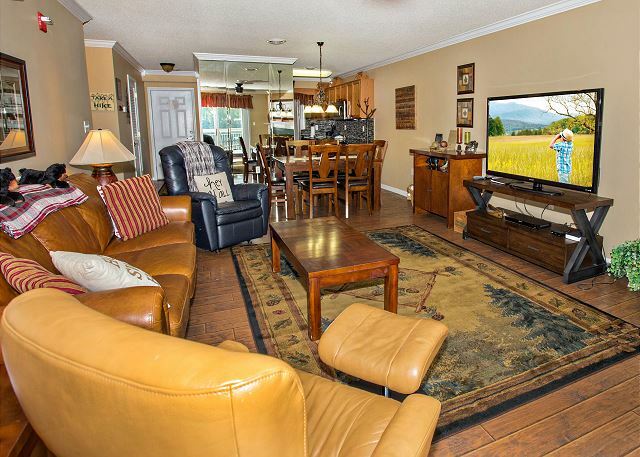 The living room welcomes all with gas log fireplace, a leather sofa, leather chairs with ottomans, recliner and flat screen TV/DVD. 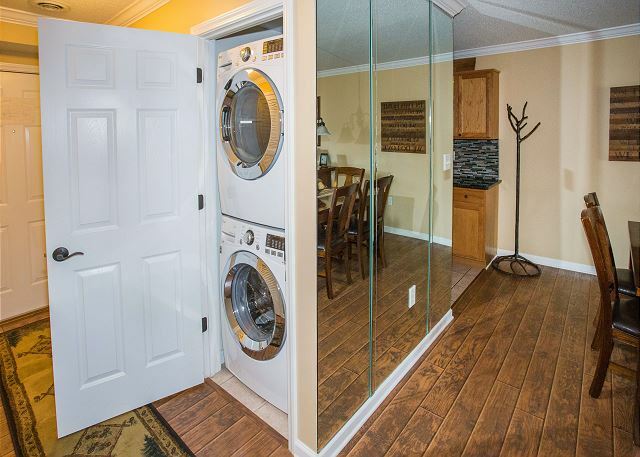 A washer/dryer, fully equipped kitchen, dining table for six, and wi-fi round out the conveniences. We hope you’ll enjoy the balcony dinette and mountain view! We had a nice stay in 552. We have stayed at Whispering Pines before; the location is great and the facilty is nice. Unit 552 is nice, well kept, and the furnishings are very modern. There were a few small issues that are to be expected but those were reported to the office staff. All the folks at WP are courteous and easy to work with. Your comments are outstanding and we hope that the small issues were corrected quickly and to your satisfaction. We appreciate your visits and look forward to your return. 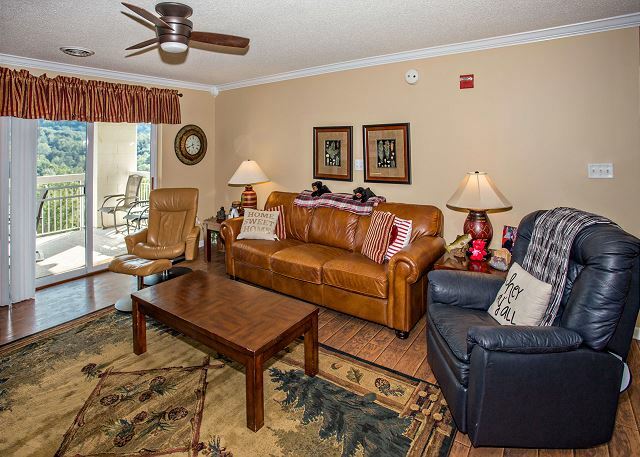 This condo is our favorite two bedroom at Whispering Pines. The beds are comfortable and they have everything you need. We love it! All the condos here are always clean and the staff is helpful and friendly! 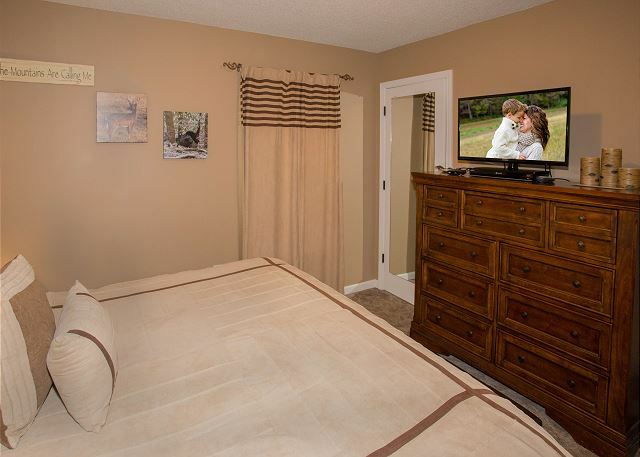 We are glad that you have found your favorite condo at Whispering Pines Condos in Pigeon Forge and that the beds are comfortable and the unit has everything you need for a great vacation. We appreciate your compliments to our staff and look forward to your return. The personnel and staff at Resort Properties are top notch. Very polite and kind. Our condo was very clean and well equipped. We enjoyed our stay just a time to rest and relax. Condo was just exactly like the pictures on the website and then some. First time staying in a condo and it won’t be our last. Wow! Thank you so much for your amazing comments regarding our staff, we are so delighted to know that our staff made such an impression on your stay. 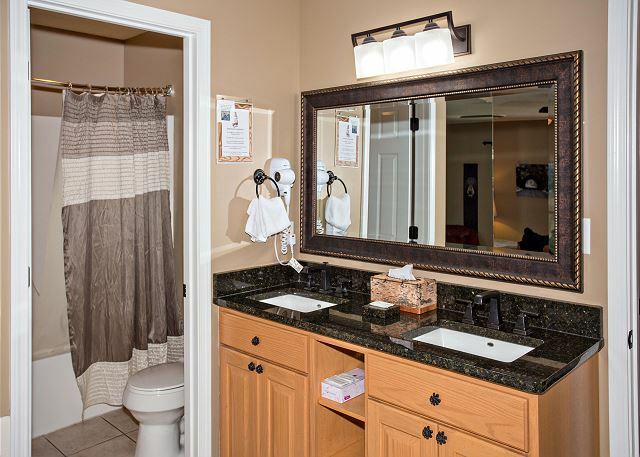 We appreciate you choosing Whispering Pines for your first condo experience. Condo 552 is a beautiful home and very popular with our guests. Thank you very much for your wonderful review. We welcome you back to stay with us again soon. We have enjoyed it! We’ve been there for two years and love the space and amenities that it has! Usually go to UT that weekend for basketball game, plus spend time in Gatlinburg the rest of the weekend! We are glad that you had a great get-away with us at Whispering Pines Condos in Pigeon Forge. The location of our condos is fantastic because you have easy access to all attractions/events in Pigeon Forge, Gatlinburg and Knoxville. We look forward to your return visits. We have stayed at Whispering Pines three times and each time we had clean and cozy condos, along with friendly and helpful staff. We can't wait to return next year. Great, wonderful. We are happy that you had a great time at Whispering Pines Condos and that you plan to return. We appreciate your top-notch comments. It is our pleasure for you to stay with us. Nice clean condo, great location. Will try to stay at this condo again when I return to pigeon forge. Book early when you plan to return and maybe this unit will be available for you since you enjoyed it so much. We appreciate your visit and outstanding comments and look forward to your return. Our experience was great. We have used this property for several years for our fall trip. We have never considered going anywhere else to stay in our trips to Pigeon Forge/ Gatlinburg area. Thank you so much for continuing to stay with us at Whispering Pines! We're happy to hear that you've had another great experience at our beautiful resort. We truly appreciate you and we hope to see you all again very soon! We love hearing that you had a great experience while staying with us at Whispering Pines. Your continued patronage means so much. Condo 552 is very popular with our guest, we are glad you were able to enjoy it. We look forward to seeing again soon! We had a great time. We had always parked two trailers in the overflow lot and while I understand only being allowed one, it would have been nice to know this in advance. Thank you so much for being a long time loyal guest with us at Whispering Pines. We apologize for the inconvenience of not being able to park park more than one trailer in our overflow area during the Fall Rod Run. We are having to make some changes due to guests taking severe advantage of our overflow lot. We look forward to seeing you again soon. Great place to stay. You’re in town, but doesn’t feel like it. This place has it all. Thank you so much for staying with us at Whispering Pines in unit 552! 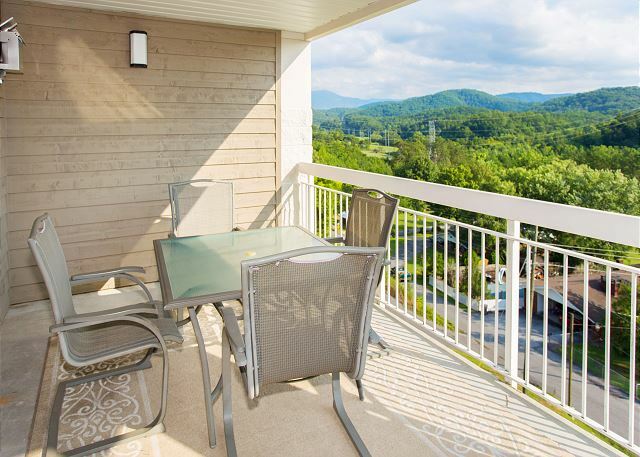 That is a BEAUTIFUL condo and we're absolutely thrilled to hear that you enjoyed your vacation here in the Smokies. We hope you'll stay with us again the next time you're visiting our beautiful area! We very much enjoyed our stay at the Whispering Pines, Room 552. Very nice room, very clean, nice pool, just a great place to stay. Would definitely recommend this property and look forward to coming back again. Fantastic Review and Comments; we appreciate them. We are glad that you had a great stay and that you plan to return to Whispering Pines Condos in Pigeon Forge. Whispering Pines is always our go-to spot to stay when we come to The Smokies! Excellent place to stay for pur family! We welcome you to spend as much vacation time with us as possible. Think you would not have a problem with that idea since you have found your go-to vacation destination. Thank you for your excellent review and comments; see you next trip for more fun time. Unit 552 was beautiful with all the updated upgrades. We felt like we were in a five star facility but only paid for a three star price. Large TVs in every room. Comfortable beds. Plenty of seating. Beautiful view. 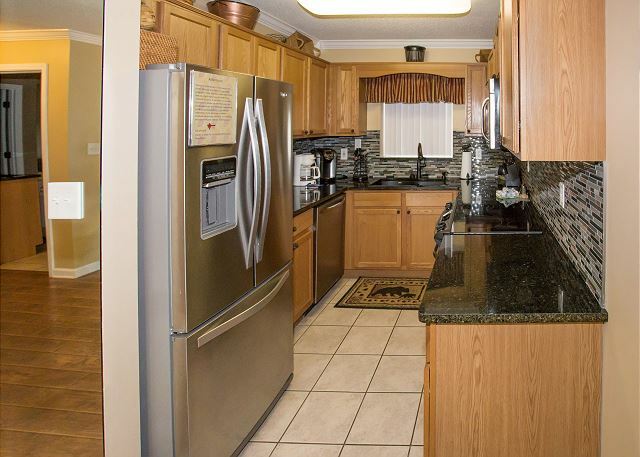 And the kitchen with all its upgrades stainless steel appliances and the granite countertops were to die for. I would highly recommend this two bedroom condo to anyone. And I can’t forget to mention the staff, from housekeeping to the office. They were all great. Your Comments as well as your Review and Title are outstanding! We greatly appreciate them all and your visit with us. It is our pleasure to have you vacation with us and we look forward to your return. This unit was beyond anything I expected...usually I come in with cleaning supplies when renting a condo...never happened in this one...All was perfect...nothing to do but enjoy...loved the leather furniture, hardwood floors, linens, kitchen,new appliances and especially the "mountain decor" throughout the unit...just hope we can find unit available when we next visit area. Great! We hope you come back soon too! WP 552 is a lovely condo and our housekeeping staff prides itself on cleanliness! Glad you all had a nice time staying and we appreciate you! This was an amazing condo with a beautiful view of the mountains!! From the big screen TV to the wonderful bedrooms, it was a comfortable and wonderful place to stay. Felt like we were at home!! Totally would recommend this condo to anyone staying in Pigeon Forge!! We will be back!! Awesome! So glad you all enjoyed your stay and thank you for staying with us! WP552 is a lovely condo and we are happy you all enjoyed it! Come back soon! Happy couple from Dover TN. Thank you for staying with us at Whispering Pines. We love hearing that you felt right at home while staying in condo 552. The condo owner completely remodeled his condo within the last year, he will love hearing how much you enjoyed staying in his condo. We appreciate your wonderful review and high recommendation to others. We welcome you to stay with us again and we would be happy to take your request for 552. Good location, close to everything it was an enjoyable trip. Thank you for choosing us for quality family time! We are happy you all enjoyed your stay and we hope to see you again soon! We have been visiting Pigeon Forge for the past 10 years and this is by far the best place we have stayed. Thank you so much for the kind words, we appreciate them. Thank you for staying with us and being such a loyal customer! We are looking forward to the next time you all can come back and see us! We stayed at Whispering Pines because our family had a couple different condos for Thanksgiving. Our family all thought our condo was the best of all of them. If you want to cook/bake you should plan to bring EVERYTHING including pans, measuring cups, etc. Thank you! We are happy you all enjoyed Thanksgiving with us! Family time is what it is all about! Come back and see us again whenever you are in town, we would be happy to have you! Whispering Pines is a very quiet and safe place to stay. This is our second time staying here and also in the same condo. Condo is very nice. Great! Thank you so much for staying with us and we are glad you all enjoyed your time here! Come back and see us again anytime! Great vacation spot in Pigeon Forge! We were very pleased with the facility. Everything was extremely nice clean the staff was friendly and the condo was just lovely. View from the balcony was great. Would definitely recommend to others. Thank you for your wonderful review. Condo 552 is one of our most requested condos with our guests, we are so glad you enjoyed it as well. Your kind comments regarding our staff and your recommendation to others is very much appreciated. We welcome you back to stay with again soon when visiting our beautiful area. Thanks to the wonderful staff at the whispering pines! My husband and I had a wonderful 3 days in room 552 it was beautiful! Loved all the free shows and events that comes with the stay! Hope next time we can stay longer with you all! If you haven't stayed here you got to check it out you will love it! We are so pleased to know that you enjoyed your 22nd wedding anniversary getaway with us at Whispering Pines. The condo owner will be so happy to know that you enjoyed your getaway in their home away from home. Your kind comments regarding our staff and your stay are very much appreciated. We look forward to your next visit with us! Wonderful! We are so pleased to hear that you have a great experience with us at Whispering Pines. Be sure to request 552 on your next visit. Thank you for kind words, we welcome you back to stay with us again soon. Everything was great. Condo was clean and looked great, no problems. Staff was friendly helpful and professional. Thank you, thank you, thank you! We pass the comments regarding Housekeeping on to them; they do a fantastic job! We appreciate your praises for them, also. Your comment, "Another Great Experience" is music to our ears! It is our pleasure to be able to help you have a wonderful vacation experience. We look forward to your return. My family and I have stayed at Whispering Pines for several years now and have always enjoyed our stay. Every condo we have stayed in has always been clean and well maintained. Our children love the swimming facilities too. Thank you for your patronage. We are glad that you have always had a great vacation with us. We appreciate your excellent review and fantastic comments. See you next vacation! Perfect Getaway in the Smokies! Great location! Beautiful scenery! everything you are looking for in a perfect getaway! Oh, how nice of you to say! Thank you! 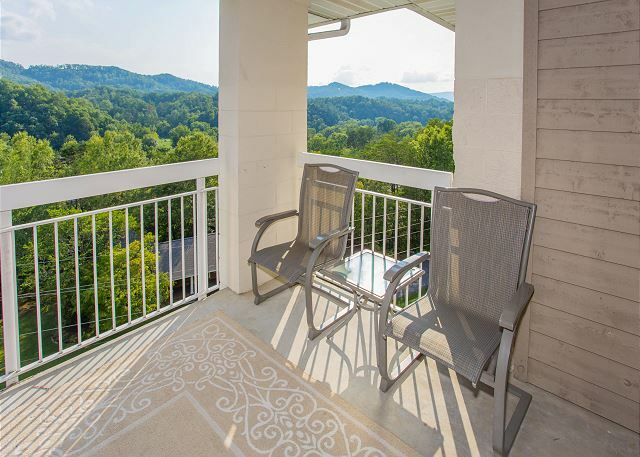 The condo you vacationed in certainly does offer a fantastic scenic view of the Great Smoky Mountains! Thank you so much for staying with us and please share the word about Whispering Pines in Pigeon Forge. Hope to see you again in the near future! We had a wonderful time and thoroughly enjoyed our time at this resort. The location is excellent! We were there for the 4th of July and watched the city's fireworks from our balcony! An added plus for sure. Terrific! Very pleased to hear you enjoyed your time in Pigeon Forge and in condo 552! We are lucky with our location as it does offer great views of the fireworks. Thanks for staying and come back again soon! Awesome Condo Close To Everything!! This condo is very very nice. There was four adults and one child in our party and it was the perfect amount of room. The furniture was very nice and comfy. The resort had an ice outdoor pool and lazy river and it also had a good sized indoor pool. There was also free DVD rentals at the front desk and a free ticket program to different shows and attractions, although we didn't take advantage of those perks. 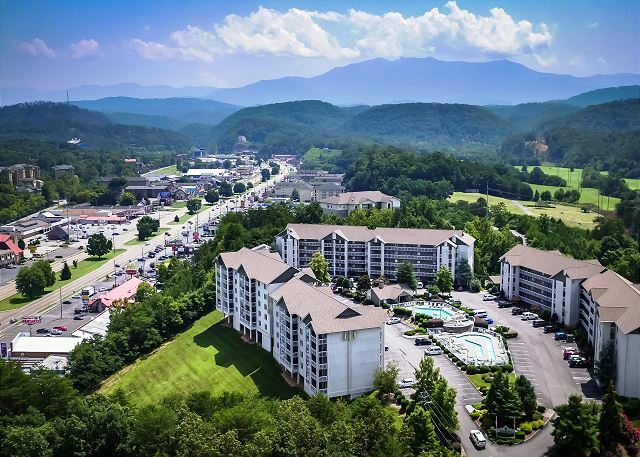 The resort is right in the heart of it all in pigeon forge. It sits just up the road off of the main drag which is nice. The only problem we encountered was not knowing how to work the tv and maintenance came within five minutes of our phone call to show us how it's done. Overall I'd recommend the condo and the condo resort to anyone looking for a place to stay in the Pigeon Forge or Gatlinburg area. Yes, our location is convenient to all that the area has to offer. Thank you for your excellent comments and review; we look forward to your return visits. Great! Thank you! We love that it was such a great vacation for you! Come back and see us again soon! The condo was very nice with great updated kitchen. The only recommendation I would have is the mattress in the master bedroom was not too comfortable. Thank you for staying with us at Whispering Pines. We are glad that you enjoyed condo 552. We will pass along your recommendation for updating the mattress to the owner. We appreciate your feedback and hope to see you again soon. This is home away from home! The condo is very centrally located to everything. It was very clean and everything was in good working order. We came at a time of year when there was not a lot of places open, so we enjoyed the free admission to the Aquarium but chose not to go to the other 2 shows that were available. We are so excited to hear that you have found your "home away from home" in 552. Thank you for your wonderful feedback regarding your recent stay. We are glad that you were able to take advantage of the FREE ticket program that we offer. We appreciate you and look forward to your return visit. 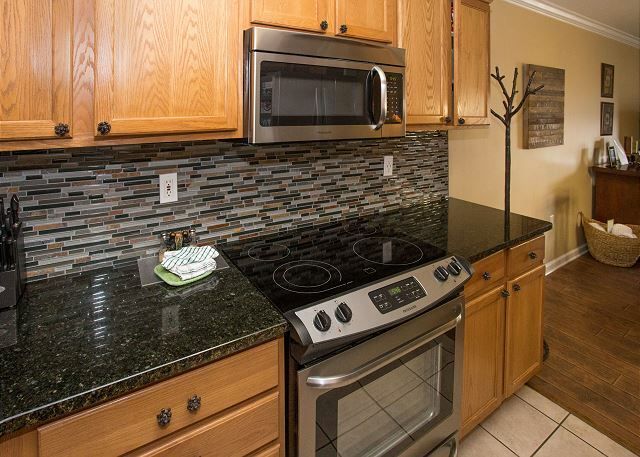 We loved condo 552 at Whispering Pines, the unit was very clean and just like described. We are already planning a return trip hoping to stay in this unit again. The office staff was very accommodating and friendly as well. Great! Thank you so much for staying with us! We love our properties! We are glad you will be coming back and spending more time with us! Wonderful place ! Can't wait to go back ! Great place to stay ! Always a great experience at Whisperig Pines ! Wow! Thank you for your wonderful review of your recent stay at Whispering Pines. We are very pleased to know that you always have a great experience when visiting us. We look forward to seeing you again soon! One of the BEST condo rentals I have ever stayed in. The owners of WP552 take a lot of pride in the upkeep in this unit. 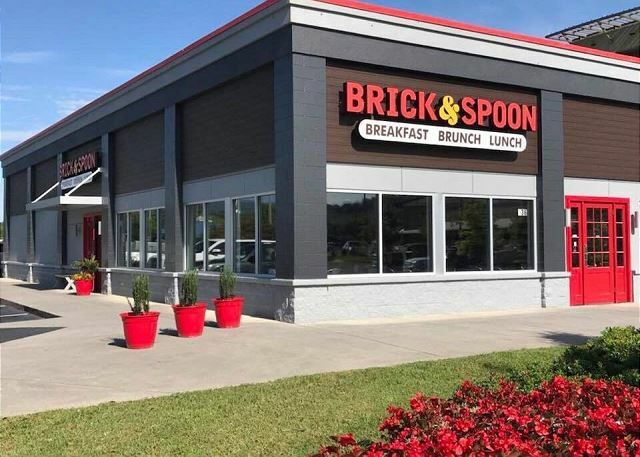 I will definitely seek this unit out the next time I visit. Also, ALL of the ladies working at the front desk were very helpful and polite. We are so glad that you had a great time while staying in 552. The owners do take great pride in their condo and we have many guests that request this condo for their stay. We appreciate your kind comments regarding our front desk ladies. We look forward to your next stay! The condo was very nice and clean. We enjoyed our time there. If we return next year we will stay in this same condo no doubt. We are so happy that you had a fantastic stay with us in October. We appreciate your kind review and look forward to your return visit. We enjoyed our weekend very much. This is the best place we have ever stayed. Will stay again. Great! Come back and see us again anytime! Thank you so much for staying with us! We appreciate you! Come back anytime! We appreciate your patronage. Thank you for your excellent review and comments. We look forward to your return visits. See you next trip. We have stayed in a few condos in Pigeon Forge over the years and Whispering Pines is over all the best place yet. It was very clean and well maintained , great location . You can enjoy the mountain views as well as being in the middle of all the action. It was a quiet and a relaxing place . The pools were well maintained .we will definitely be back! We stayed in unit 552 and it was beautiful ! Thank you for staying with us at Whispering Pines. The owner of 552 just remodeled his condo and will love to hear how much you enjoyed staying in his home. We are glad that you enjoyed our convenient location as well as our pools. Thank you for your wonderful review. We look forward to seeing you again soon! Our condo in 552 was beautifully furnished. When I made my reservation I asked if there was an elevator. (My husband has mobility issues and stairs are most difficult for him). They also mentioned they had luggage carts. Perfect I thought. To my dismay, to get to 552 we had to go up a flight of stairs to get to the elevator which took us to our condo. Since he has mobility issues, this meant that I had to carry ALL our luggage and misc items up the stairs and THEN put it on the luggage rack. Not good...not good at all. The condo was beautiful, the view was breathtaking. I was MAJORLY disappointed in the access to this particular condo for someone that had mobility issues. Thank you for staying with us at Whispering Pines. We are so glad that you enjoyed condo 552. We are terribly sorry that you had an issue with getting your husband to the condo. We have many walk straight in condos, no elevator or stairs needed. The view from 552 is simply amazing and we are glad that you were able to enjoy it. Please don't hesitate to let the front desk know if you have an issue during your stay, we will try our best to help you in any way we can. Again, we are terribly sorry that this condo was not sufficient for your needs. We hope that you will stay with us again, we will be happy to help you find the perfect condo for your stay. We loved the condo and all the amenities. The pools were awesome. I enjoyed the lazy river. It was clean and a very nice facility. The furniture was very comfortable. Happy to hear you all were able to enjoy the property amenities while you were staying with us! Thank you so much for taking the time to tell us and others about your trip-we hope to see you again soon! Thank you for your visit and excellent review. We are glad that you had an excellent stay at Whispering Pines Condos in Pigeon Forge, TN. Thank you for your customer service comment. We look forward to your return visits. Our condo had been recently updated and was very nice. We wanted for nothing. This was about our 9th year in a row with Whispering Pines. The Lazy River had been renovated. This was especially important for us as it is one of the main reasons we stay at WP. Our son is quite handicapped and he loves to float in the river. We can all relax. Look forward to next year. Wow, thank you for your wonderful review. The owner of 552 will be so happy to know how much you enjoyed their condo. We appreciate you being a loyal guest with us, we hope that you feel right at home. We are glad that the entire family can relax and take it easy in the lazy river. We already look forward to seeing you next year! We stayed in Whispering Pines for about our 5th visit now. Condo 552 was fantastic. The décor is so Smoky Mountain themed and we loved it. The view from the condo was gorgeous. Our weather was gorgeous for our stay and we were so pleased as always with the facility. We ever stay anywhere else while visiting the area. It is so convenient, quiet, and all around great at Whispering Pines. Highly recommend staying there. So glad to have had you all back with us! Thank you for returning again and again and for your kind comments regarding the property and the condo itself. All of our condos are individually owned and the owner of 552 just finished completely remodeling it so he will be thrilled to hear that you thoroughly enjoyed his renovated unit. Thank you for always recommending us and we hope to see you again soon! The property was as described. Very good location and clean. Staff was nice and helpful. Could not have been any better, came back a second time, brought our cousin that time and she absolutely loved it and is going to tell another friend about it. I would give it a A plus and tell anybody that wants to love what they find, you have found it, pack your bags now!! Amazing condo and place and location! Thank you for your A plus rating for unit 552 at Whispering Pines Condos in Pigeon Forge, TN. You are right on target when you state that the condo is amazing and the location is perfect. We appreciate your fantastic review and patronage. We are looking forward to seeing you again. 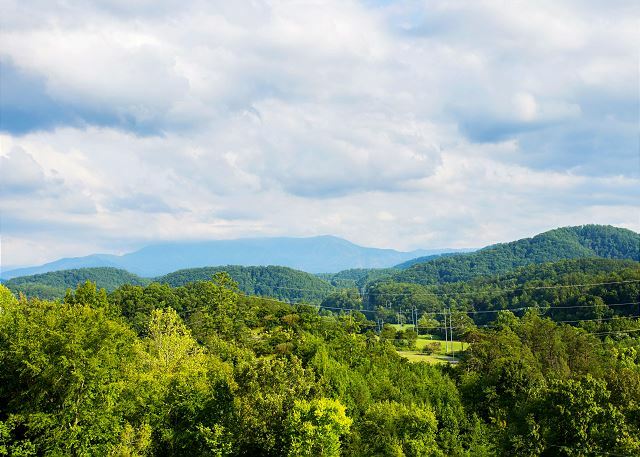 Pack your bags and head toward Whispering Pines Condos in the awesome town of Pigeon Forge, Tennessee! Staying in this condo was just like staying at our own home. It was extremely clean, and very comfortable. We could not have asked for a better place to stay. A big thank you to the owners for making it so nice. We could not ask for any better comment than " it was like staying at our home". Thank you for your wonderful review. We appreciate you and hope to see you again. Amazing place to stay. Defiantly recommend. Clean and family friendly. Amazing place to stay especially for the rates hey charge. Thank you so much for staying with us and we hope you enjoyed the beautiful 552! The owner has really outdone himself with that unit! We hope you enjoyed the amenities on property (Indoor Pool, Sauna, Fitness Center, Arcade) and free tickets that our guest receive as well. We appreciate you VERY much and hope to see you again! Safe Travels! Thank you for staying with us and for your Awesome review. We look forward to seeing you in March. Balcony. Our family would like to stay there again. Thank you for your visit and review. Your comments are typical of guests who stay in this unit; the owner has done a wonderful job with the furnishings and decor. Call us and we will be glad to reserve the unit for you! This condo is beautiful. Beds and chairs were very comfortable. We have already recommended this to others who to stay here. Great vacation! The Aquarium is awesome. Awesome is awesome! So glad you enjoyed your stay! Thanks for letting others know how great we are! We try hard! Great, great, great!!! Welcome to Whispering Pines Condos in Pigeon Forge, TN. We are grateful that you have found us and will enjoy many years of vacations with us. Looking forward to seeing you again. Very nice place to stay. Loved furnishings and layout of the place. Indoor pool, a plus for us. We are so happy you enjoyed your time with us! We love making people happy! Come back and see us again! My family decided to celebrate Thanksgiving this year in the mountains. The condo was lovely and close to everything. We had everything we needed in the kitchen to prepare an wonderful Thanksgiving meal. We plan on making this a family tradition. We are glad that you spent Thanksgiving with us at Whispering Pines Condos in Pigeon Forge, TN. Thank you for your excellent review. We look forward to your return visits. Whisking Pines is the best, we have stayed there for yearns,never been disappointed,love the condo. Thank you so much for your wonderful review. We are so happy that you enjoy staying with us, we appreciate you. We look forward to your next visit. I loved this place!! The decor was perfect, who ever remodled and decorated this place did a fabulous job! I will definitely return here again. We love having you as our guest at Whispering Pines. 552 is newly remodeled and the owner did a great job. Be sure to ask for 552 when making your next reservation. We look forward to seeing you again! I am so glad you like your unit, Mr.Copenhaver!! This is such a treat- I helped you book your stay and I was excited that 552 was available so you could enjoy this unit! The owner is awesome to keep upgraded and in tip top shape for his guests! Again, so glad you loved it- can't wait to see you next time! #552 at Whispering Pines is AWESOME!!! This is one of (if not the nicest) condos that I've ever stayed in! All sorts of upgrades! Beautiful kitchen, gorgeous décor, comfortable beds, and extremely clean! Would stay again in a heartbeat! Thank you for your review. 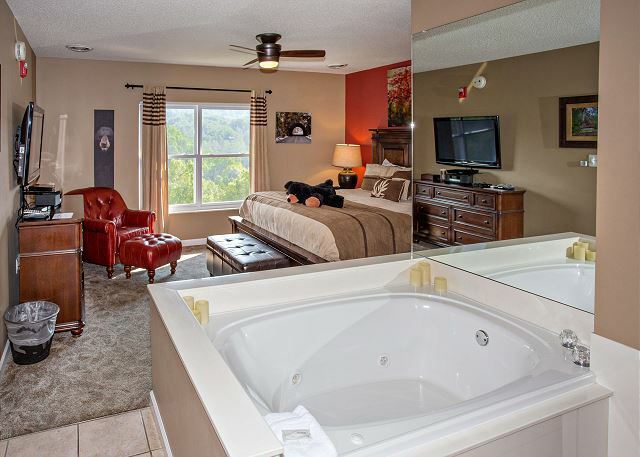 What more needs to be said than AWESOME for Whispering Pines Condos unit 552 in Pigeon Forge, TN. Normally when my family and I head to the Mountians we ALWAYS rent a cabin. This time my 2 year old niece was with us so we opted for a condo so that she could have a pool to swim in. We were all bummed the whole way down there but when we got there we were amazed. The updates in room 552 were beautiful. We talked the entire time we were there about how much we loved the room. The staff checking us in were nice. And the lazy river was an added bonus. My family will no longer rent a cabin when we head down. We will definitely stay in 552 again! Thank you for your wonderful review! We are so pleased to hear you enjoyed your time in condo 552 at Whispering Pines! We strive in offering a fun, relaxing place for families to come together. It sounds like we accomplished just that. Thank you for staying with us and we look forward to your next visit. We got this room last minute coming down for a weekend the pools and lazy river are great and clean the condo was awesome so many little things that made our stay more enjoyable (even ice cream cups for the kiddos!! And the view was FANTASTIC! Our only complaint was the matter shower head didn't flow very well other than that we were more than pleased and will definitely be back! Thank you for staying with us at Whispering Pines Resort. We are happy to hear that you enjoyed the pools, lazy river, the wonderful view from the balcony and the little extras that our condos offer. We will have our maintenance department check the shower head. Thank you for your review and we look forward to seeing you again soon. Great experience. Wonderful accommodations, great location, outstanding service from staff before and during trip. We will be back. Suggest putting a ceiling fan in bedroom 2. It makes a wonderful difference. Sleeping in bedroom 1 was much more comfortable because of the fan. Everything else was PERFECT. Thanks for staying with us! We will absolutely forward your comment about the 2nd ceiling fan on to that condo owner. They love to hear from all their guests. Happy to hear you found everything else to be great and we certainly look forward to having you return again! Our stay was fantastic!! It was close to all the attractions and restaurants. The pools were a hit with our kids. Thank you for your feedback! 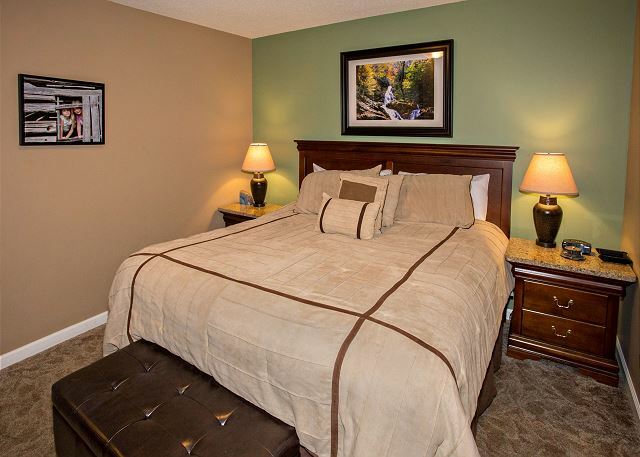 We are pleased to hear you enjoyed the location and amenities Whispering Pines has to offer. We appreciate your patronage and look forward to your next visit! 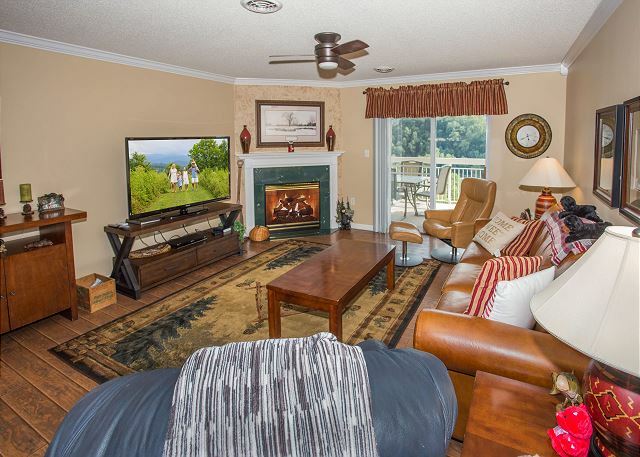 Whispering Pines condo 552 was in great condition. Clean with good amenities including some board games and DVD movies. Keuring coffee maker was a super addition to the kitchen. Recommend checking master shower head as it did not spray evenly. Also apple cinnamon air freshener was a bit to strong for our liking. Glad you enjoyed your stay at Whispering Pines unit 552. While staying with us, please let us know of anything that needs our attention, i.e. shower head and the too strong air freshener. Service Orders have been submitted for these. It was a wonderful stay. The condo was beautiful. We loved our stay. It was beautifully decorated. We will certainly stay again and would love to stay at the same condo. We are so pleased to know that you loved your stay at Whispering Pines. We are happy to take condo requests for upcoming reservations so please let us know when calling to reserve for your next getaway. We cant wait to see you again soon. The condo was great. It was perfect for our stay. We were very satisfied with it. Everytime we have stayed here, we have always gotten clean condos. Great time. We are so lucky to have a great housekeeping staff, they do such a wonderful job and they will be happy to hear you found the condo clean and satisfactory. We appreciate you staying with us and we hope you choose to stay with us the next time you are in town! We had a great time at Whispering Pines. A great location, great rooms, and a tremendous place to enjoy family fellowship. A great trip! It is wonderful to hear you had an enjoyable stay with us. We are blessed to be a place where family and friends can meet and make memories to last a lifetime. Thank you for staying with us! 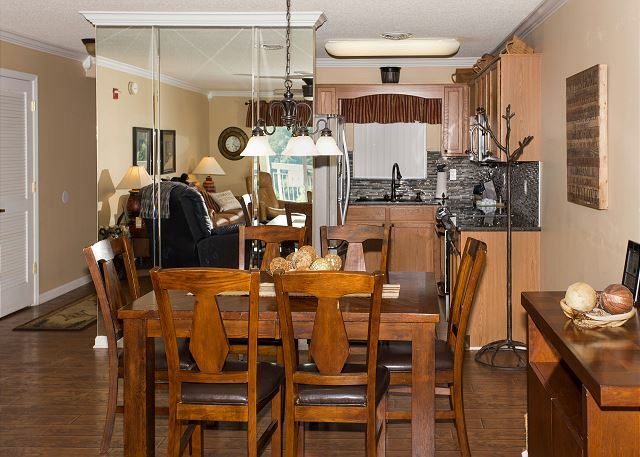 We had a wonderful time during our stay at Whispering Pines (condo 552..) The Condo was clean, spacious, and felt like home.. I would recommend this property to friends and family..
We love having you stay with us, glad the family enjoys spending time with us! Our condo was perfect! We had plenty of room for our family of five and the condo itself was so clean and new looking. The convenience of location and overall experience was wonderful. The staff was so friendly from the beginning of the reservation to the end of our stay. We stayed there 10 years ago with a great experience and had the same, wonderful experience this time. This is going to be where we stay everytime we visit. Thank you so much. That's wonderful news, so happy you chose to stay with us again after 10 years! We hope to see you again soon!